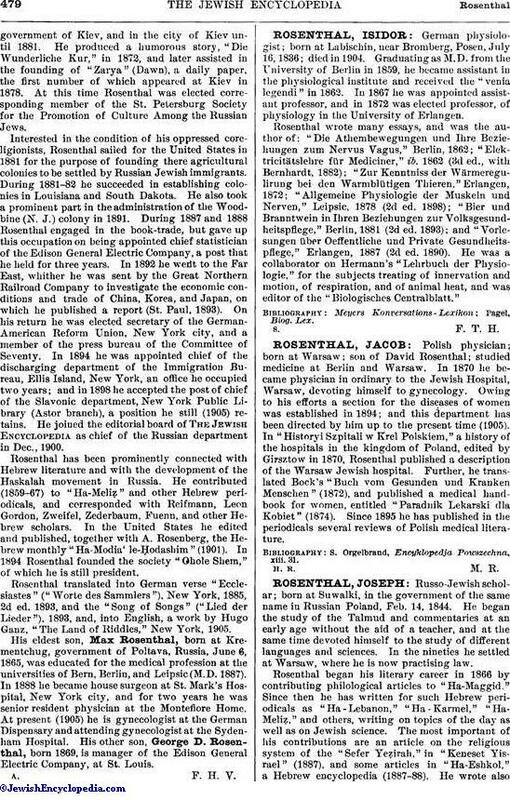 Polish physician; born at Warsaw; son of David Rosenthal; studied medicine at Berlin and Warsaw. In 1870 he became physician in ordinary to the Jewish Hospital, Warsaw, devoting himself to gynecology. Owing to his efforts a section for the diseases of women was established in 1894; and this department has been directed by him up to the present time (1905). In "Historyi Szpitali w Krel Polskiem," a history of the hospitals in the kingdom of Poland, edited by Girsztow in 1870, Rosenthal published a description of the Warsaw Jewish hospital. Further, he translated Bock's "Buch vom Gesunden und Kranken Menschen" (1872), and published a medical hand-book for women, entitled "Paradnik Lekarski dla Kobiet" (1874). Since 1895 he has published in the periodicals several reviews of Polish medical literature. S. Orgelbrand, Encyklopedja Powszechna, xiii. 31.